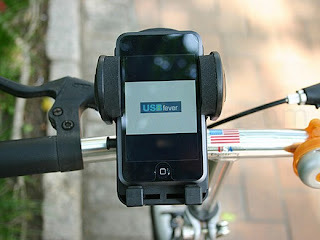 USB Fever, offers iPhone consumers new portable gadget for bicycles - The iPhone Bike Mount. One can mount iPhone Bike on a steering wheel, and enjoy a good movie, browse internet or check emails while riding the bike. Be aware not to front-brake too hard, and protect your iPhone from the elements. 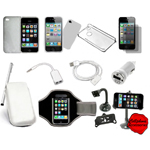 iPhone Bike Mount costs only $14.99 and you can order it on the USB Fever Website. First step to order an item on the USB Fever is to register on the website the system is developed for all major browsers (e.g. Firefox, IE...), then find items if you know the exact address, you may simply type it and go and the last step you should do is just to click the icon "Buy". After making the payment, you will receive an order confirmation email from USB Fever .com and PayPal for reference. During Peak seasons (e.g. Christmas, New Year, and Easter) or some special occasions ... it may take 1-2 weeks longer. Security after ordering and paying for an item is important, regardless if you use credit, debit or PayPal none of your information is stored with usbfever.com. All transactions go through PayPal. This is an excellent way to stay green by using your bike,incorporating safety so you arent playing with your apple iphone whilst your cycling. Another good way to help the enviroment is to recycle the mobile phone after usage.